The Simpson Park trail starts here, at the second of two gates off the parking lot at the northern end of Waverly Drive. 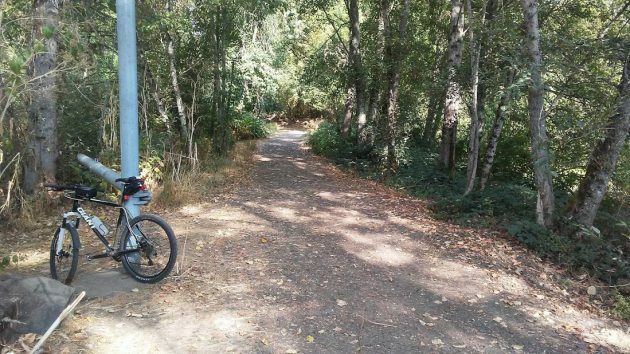 September is a great time to venture out on Albany’s two riverside trails, one on each side of the Willamette. I was reminded of this when I rode my bike along the Simpson Park trail last week. As the name implies, this trail leads deep into Simpson Park, for a little more than a mile. Then there’s a loop that turns you back in the direction you came. You don’t even have to get off your bike to turn it around. That’s on the Willamette’s right bank. On the opposite side there’s the Takena Landing trail, which starts under the two highway bridges and extends downstream for about the same distance. Of the two, the Simpson trail is wider and more level. But either one is fine for running, walking (with or without your dog), and riding your mountain bike as I occasionally do. Because there are other users, if you’re on your bike you must remember normal courtesies such as slowing down, letting people know you’re coming and thanking them for making way so you can pass without running down either them or their children or pets. 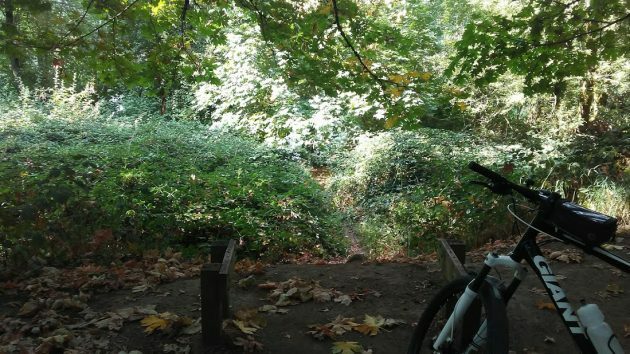 When Simpson Park comes up in social media, people sometimes complain of the homeless known to camp out in the brush or even, as was reported some time ago, in underground caves. I’ve never had any troubling encounters there. But if you’re nervous about this, go with someone else, or even as part of group. The Simpson trail leads downstream between the Willamette on the left-hand side and First and Second lakes on the right. In summer and early fall, though, you can barely see the water through the jungle of riverside bushes and trees. What makes September an ideal time to visit these trails? Unlike in winter and spring, now the ground is dry, hard and not at all slippery. And the paths are beginning to be covered with a sprinkling of fallen leaves, nice to look at and a fine surface for your tires or your feet. Motorized vehicles are prohibited, naturally. At Simpson Park there are two gates to keep them out. Both are easy to walk around, but the second was a bit of a challenge to pass without getting off the bike. I asked about why it was closed most of the time, and Rick Barnett of the parks department agreed there was no need as long as the first gate is there. So last week I was glad to find that gate No. 2 was no longer shut. There used to be a bench here and you could sit and see the river, but no more: No bench, and the foliage is too dense.